Learn to grow the Garden of the Future in your own home. Enter your name and email address and we’ll email you this 49-page eBook , The DIY Hydroponics System Guide! There are many variations on hydroponics systems from Ebb and Flow to Aeroponics, and many more. We outline how each system type works so you can better decide which system is right for you. There are many options when it comes to hydroponic grow mediums. We give you the breakdown of the pros and cons of each type to help you decide what is right for you. Here are all the supplies you’ll need to get started growing your own Marijuana, Hydroponically, in your own home. We breakdown each component, why it’s useful, and what’s your best available option. Our plans for a DIY Aquaponics System. with diagrams and breakdowns on all the components you’ll need to build your own Aquaponics System at home. Get started on your dream home garden today! Some fish do better in Aquaponics than others. We detail which fish work best in Aquaponics with ideal water temperature ranges and the times needed to grow them to plate size. We’ve scoured the internet for the best LED Grow Light Video Reviews. Here we offer the best of them with our analysis on each LED Grow Light and recommendations on which is right for you. Check it out! We’ve compiled all the best videos on Hydroponics System Reviews available and offer our recommendations for which type of Hydroponics System is right for you. From beginner to expert, we offer it all. Herbs can be a great place to start with your first small hydroponics system. If you’re starting out with aquaponics, choosing the right aquarium is key. Hydroponics Towers allow you to grow a lot more in a smaller space. Hydroponic trays are a crucial component of hydroponics growing. Though often overshadowed by flashier elements of hydroponics systems, grow trays are an essential component to support the plants and contain the growing substrate. Learn more about the best trays available. Hydroponic growers often struggle with providing uniform and ideal conditions to their plants. Indoor marijuana growers are dually challenged because they also worry about odor control and keeping their cannabis plants hidden. Fortunately, Grow Cabinets provide a simple solution to these common problems. The reservoir is an essential component to any hydroponics system. As discussed in previous pages, hydroponics uses a nutrient solution (water and fertilizer mix) to provide nourishment and hydration to plants. 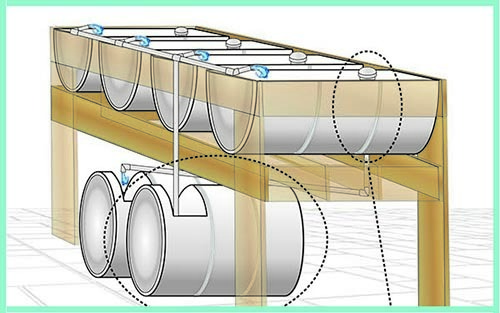 Thus, a hydroponic reservoir is essentially the storage tank for the nutrient solution. “Thank you so much for all the great information. We started our first hydroponic garden a few months ago using your website and we just had our first harvest. So exciting!